Seelaus and the other five students—members of an energy-themed Bass Connections project partnering with the DCOI, the Nicholas Institute for Environmental Policy Solutions, the Pratt School of Engineering, and the Nicholas School of the Environment—were out to learn whether an on-campus anaerobic digester could cost-effectively do for food waste what the digester at Loyd Ray Farms was doing for hog waste, thereby helping Duke meet its goal of carbon neutrality by 2024. To answer that question, the students undertook a feasibility study with three components: a food waste audit at Duke; a survey of relevant federal, state, and university policies; and an economic modeling exercise, which was executed with guidance from team member Brian Murray, Environmental Economics Program director at the Nicholas Institute and interim director of the Duke Energy Initiative. For Murray, just as important as the study’s main aim was its provision of an intense interdisciplinary energy education—one requiring students to calculate biogas yields and understand renewable energy credit markets. 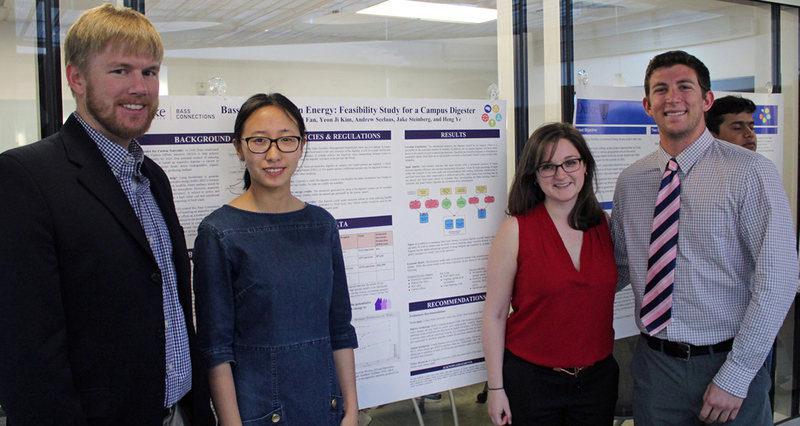 Over the course of the project, the students identified several obstacles to operation of an on-campus digester. Duke’s waste stream is too small for all but one commercially available digester, necessitating a custom-built facility. The stream could be increased if Duke partnered with other food facilities, but that option is precluded by a university policy prohibiting waste from being brought onto campus. Accommodating additional waste by siting the digester off campus would mean distancing the digester from any infrastructure that would utilize methane production to generate electricity, increasing costs and reducing the project’s educational potential for Duke students. Ultimately, the economic feasibility analysis indicated that, as a standalone project, a campus digester is not cost competitive given the low electricity rates paid by Duke and the low price of natural gas. According to the students, nearly every scenario they modeled yielded a negative return. But the students did conclude that a small food-waste digester could be justified on the basis of its educational value if students were allowed to design and build it on campus, where students and faculty could readily access it as a learning lab. Validation of that educational value, they said, could come in the form of grants covering some or all of the project’s capital costs. Duke University Facilities Management vice president John Noonan has expressed willingness for his staff to help students design, and find a location for, a facility. One of the project’s other faculty partners, the Pratt School’s Marc Deshusses, is contemplating a course that would offer students an opportunity to pursue the work. For the students who were part of the initial project, the takeaways go beyond the feasibility study’s conclusion. Undergraduate Eva Kim picked up problem management skills that she wasn’t getting in the classroom. Story by Melissa Edeburn. Photo by Sarah Dwyer.